Xerin sounds off about games that sell you a chance at an item you want. 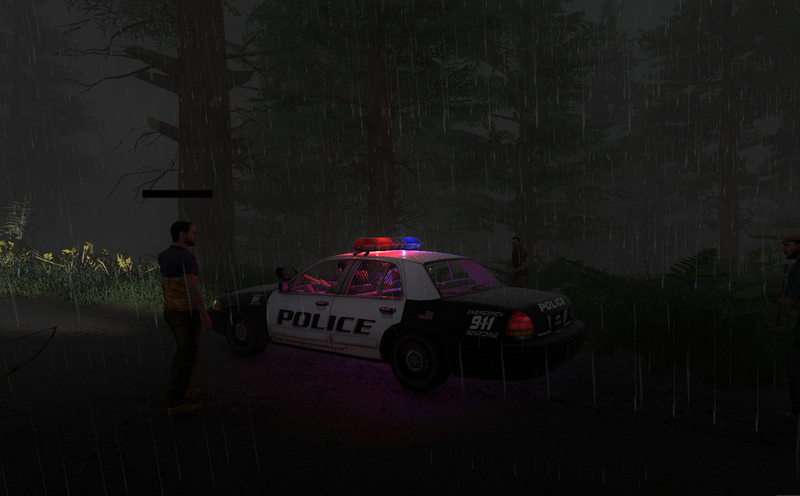 Not being particularly into the zombie motif, I find myself pleasantly surprised with how much I'm enjoying H1Z1. While I still find the zombie battling completely unentertaining, it's really the whole gameplay experience that I'm growing increasingly enamored with. Unlike your typical MMO experience, SOE's zombie survival title shifts a player's focus from late-game pursuits to the here and now. Instead of being concerned with how you can ascend to the end-game plateau and participate as soon as possible, H1Z1 instead requires you to focus on the present. Nothing is guaranteed in this game except death, which will happen via starvation if you remain idle or complacent. It's a mechanic I haven't seen employed in quite some time, as even Minecraft (a widely popular survival/crafting game) allows you to just sit safe and sound for as long as you want, if it's not modded. With H1Z1 your hydration and energy pools both start ticking down the first second you step foot in-game, both of which will start draining your health once they get depleted. There is a sense of urgency in the game, which is only further heightened by the fact that you're thrown into a world full of zombies, wolves, bears, and players - none of which have your best interests in mind. The world is extremely dark at night, and any use of light-sources is bound to attract unwelcome visitors the more you use them. I am particularly fond of how campfires function in the game. They are absolutely essential to survive (purifying water, cooking food, and keeping warm), but are also the best way to get yourself swarmed by the undead or ill-intentioned players. More than anything else though, H1Z1 sets the stage for a memorable journey - as so many of the game's mechanics create tension and importance on the present (which is an acute departure from the end-game mentality most MMOs present). Whether you're alone or with a friend (PUG or otherwise), there is constantly something happening, and crucial decisions are frequently being made. In a particularly crowded server, every single piece of scavenged loot is priceless and could mean the difference between life or death. All of the above is an ideal mixture of ingredients to create memorable gaming moments. Alas, we get to the story! It was late Saturday evening, at about 9PM when I finally put the kids to bed and was able to log in. One of my guildmates also happened to be on and was interested in exploring the perils of H1Z1 with me - so we logged into the same server and started tracking each other down - which was quite an event itself. It took us about twenty minutes to find each other (in the middle of the night - of course), and we were both thirsty and extremely hungry by the time we linked up. We tried to scavenge nearby blackberries in the dark of night, but the picking were scarce in our immediate area. Right away we made for the nearest large silhouette we could make out in the distance and had to take down a couple zombies in near pitch-black lighting, with little but our fists and a single combat knife between the two of us. The end of the battle left us both below 50% health and still nearly starving. We started shredding our shirts to bandage ourselves before scrambling around the surrounding area looking for a few more precious blackberries to get us through till sunrise - which increasingly felt so far away. That inevitably led to us attracting more zombies, but we manage to defeat them and even score a kill on a wolf and deer. Still pitch-black, we returned to the previous two-story brick home we'd ravaged mere minutes earlier and decided the safest place to build a fire would be upstairs on the outside balcony (go figure, right?) I had a couple bottles of stagnant water I'd discovered before the two of us linked up, and my guildie had found a hatchet inside the home. He was able to collect a couple logs and we set up camp, purifying our water and cooking the two slabs of wolf meet and deer steak we'd just acquired. Before we'd even had time to finish eating them and resorting our inventory, the base of the house already had a fair number of zombies collecting around it, our best guess was about five or six. Since we were still too wounded to risk a large battle, we decides to make our break and run for a nearby clearing. My guildmate went downstairs and was met with zombies at almost every door. I decided to try an alternative approach and hop over the balcony and sprint away. I chose poorly. He found the garage door clear and was able to escape unscathed, while my heroic balcony leap cost me an addition 15% health loss, putting me around 25% left. Our mixed methods also led to us losing each other for a few moments in the darkest part of the night, the period of dusk after the moon was down but the sun hadn't yet started to rise. We linked back up again using teamspeak and the "/loc" (the same way we managed to group up in the first place), and the sun started rising. We decided from that point on we'd plan to stock up on blackberries and fill our water bottles during the day as we scouted out new buildings to loot. We tried to stay as far as we could away from roads or other players - as both of us had encountered ruthless PvP in our first minutes of the game. I'm going to confidently say that daytime is significantly shorter than night-time, as the precious daylight quickly faded back to a brooding night time atmosphere. Fortunately we'd stocked up on blackberries and purified our new water prior to sunset. My guildie was also fortunate enough to have looted a backpack and a machete during the day - while I myself acquired an axe and combat knife of my own. The second night felt the longest of all of them. My sense of direction was totally confused as we ran around a nearby forest in the cold and rain. I just tried to follow my partner as we moved from house to house and looted everything we could find. We hop-scotched from house to house, and had a much easier time dispatching zombies with our newly acquired weaponry. It didn't take long for the two of us to start finding enough food supplies to reduce our reliance on blackberries, which we then started using in our water for the extra energy boost (and inventory space saving). His backpack was our lifeline and allowed us to finally start getting ahead in the supplies department. Eventually we even started finding a car-part here and there, and we juggled items and inventory space to ensure we kept and used as much as possible and didn't leave anything behind if we could help it. It was a long and rainy night of pilfering, but the repetitive sound of the rain eventually became very soothing - dulling my senses to the standard ambient noises that always made me feel like I was hearing something nearby. Throughout the night we'd both managed to equip a red motorcycle helmet and dark navy t-shirts, which had us looking like a pair of motorcycle gang members sprinting around the world. We stayed savvy the next day and made sure to fill up on blackberries where we could (you never know when you'll need them) and get clean water for the next day. We found a gas-station and autoshop at midday and even came across a few non-violent players that we were almost certain were setting us up to be ambushed when they informed us of some "stuff they couldn't carry" in the back room. With our weapons drawn we cautiously proceeded inside to investigate. To our relief, our gut instinct were wrong, and there was in-fact a can of beans and an MRE left-over we were able to squeeze into our now-bulging inventories. We considered that encounter to have been a rare bout of luck, and decided to not try our luck by staying so close to the road and other players. We pillaged a few nearby houses before running off into the forest again for the night. Having plenty of supplies on us to last us through the night and next day, we decided to hike up the central mountain range and investigate the radio tower on one of the peaks. Even devoid of zombies and wildlife, the journey was still full of danger and near-peril, as both of us nearly slipped off to our deaths a couple times each. We ended up having to run with our flashlights on almost the whole way. It felt like it took us a good 20 minutes of running to make it to the radio tower, but we managed to arrive unscathed. There wasn't anything of value to loot, but we were able to take a moment to rest, eat, drink, and start another campfire to cook up some animal meat we'd killed earlier in the day. That turned out to be a bad move - as the fire ended up attracting other players (who knew a campfire on a mountaintop would be so easy to see? XD). Anyhow, we ran around the chainlink fence and dropped down into the prone position, hoping they wouldn't see us. Fortunately (and hilariously) we never got to see the other players, as at some point as they were trying to get to our location they slipped off the mountain and died. It was far too dark for us to track down their bodies and loot them, so we just enjoyed the laugh and decided we'd leave the campfire and radio station behind as soon as possible. As we came down the trail leading up the radio tower, we ended up stumbling into another player's shelter. It seemed to be of the larger type, as it had a deck foundation, stairs and everything. We quickly learned that the entry doors (although locked) took damage when attacked, so we spent the next few minutes beating down the doors and breaking in. All the noise and effort turned out to be worth it - as there were two storage chests totally full of gear. All kinds of metal and pipes, lighters, and other food stuffs that there was absolutely no way we could begin to carry it all. We spent a good 10 minutes shuffling our inventories around until we felt set to depart, with a full set of police-car parts to boot! Even more fortuitous, a nearby campground had two cop-cars in the middle of it, one-wrecked - but the other one appeared to be repairable. 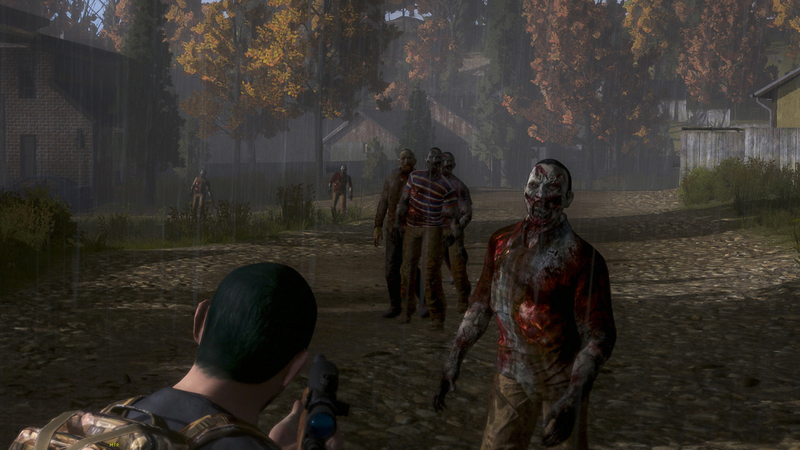 We killed several zombies in order to clear the camp, but eventually claimed the site as our own. It was then that we decided to totally heal up and make one last campfire for food and water - and also to burn up some animal fat for biofuel, the last component we needed to go cruising. We had just barely gotten everything finished and hopped into the now-working police cruiser when a bear showed up (possibly attracted by the fire). We decided to test our limits and immediately tried to ram the bear with the car - which worked out perfectly. One swift slam sent the bear sliding down a hill in a crumpled corpse. We got out just long enough to loot it's remains (bear steak is quite filling, by the way), before loading back up in the cop car and setting out on our first joyride. Little did we know, it would also be our last. It was still late night, though growing closer towards morning. We couldn't figure out how to turn the headlights on, so we were driving around totally blacked out (which may have been a good thing). Somehow we managed not to wreck as we sped around from location to location, looting what we could and dropping any extra supplies in our spacious new police-car trunk! We were quite full of ourselves by that point, so we picked a nearby location on our out-of-game map that we knew would be infested with zombies and set out to see how many we could kill. It turned out to be surprisingly difficult to mow them down in the dark before dawn without any headlights (and without running ourselves off the road). Just as the sun started to rise in the earliest hours of dawn, we finally came across another group of players. There had to have been at least five or six of them, but in our car we felt invincible. We decided we'd try to mow them all down and load our trunk with any gear they might have, which was by far our most reckless decision of the night. We nailed a couple of them in the first pass (instantly killing them), but the group quickly coordinated and started firing their guns and arrows at our vehicle - the durability of which dropped faster than we could even react to. We didn't even have time to back away before the car caught fire and exploded - killing us both instantly. We sat there in a bit of shock and disappointment for a few minutes. We were both quite salty that the players were able to do so much damage to our vehicle with mostly arrows and melee weapons, but we both knew deep down that we'd also been far too cocky and comfortable with all our new-found resources. How quickly the tables had turned. In the blink of an eye we'd gone from living the high life, rolling around in a working vehicle with extra food and water for days... to starting over completely with nothing to our names - split apart by thousands of meters that neither one of us wanted to cover alone at 1AM real-time (for me on Pacific time, and him much worse on Eastern). As crappy as it was, it was the perfect ending to the night. We were comforted in the fact that we went down in a final blaze of glory, with a lot of great laughs and horror-filled close calls on our multi-day run together (covering at least 5 hours of time IRL). It was a smashing good time, the likes of which I hadn't really experienced in quite a while. It's going to be one hell of a ride, if last night was any indication. Thanks for reading everyone. I hope you enjoyed hearing the story, though playing it out was a dozen times more fun and entertaining than telling it - which even still was very fun and enjoyable to recall! I'll leave you all with one simple pro-tip learned through my first long and entertaining night. Useful In-Game Tip of the night! Storage is the rarest and most valuable resource of all! If you're starting from scratch, shred your pants and t-shirt for cloth scraps immediately. You can use six of them to craft a satchel (300 bulk inventory space - compared to the 190 you get from leaving the two clothing items intact). It's a significant early inventory boost, and you're very likely to come across more clothing in your early scavenging (t-shirts were one of the most common drops we found). Not only that, but the satchel can later be combined with a "Backpack Frame" (4 wood planks and 4 nails to craft) that holds 1000 bulk inventory. Also, the additional 2 scraps left over (you get 4 each from the pants and shirt, for a total of 8) you can craft into either an extra bandage, or use to give yourself an early Bow Drill (1 scrap of cloth, 1 wood stick, 1 wood plank) which is the cheapest and easiest repeatable igniter (also only takes 10 bulk of your inventory).